I live in Canada. We are a very diverse country. But if you live in Canada, most of the stuff you hear about Nigeria is not favorable. Most of you have heard of Boko Haram, but today I am here to bring you the favorable side of Nigera via entertainment. Naij is a Nigerian website for all your entertainment news online. There is even news from North America! Anything pertaining to arts and entertainment is written about on this great site. The articles are very well written, and have much detail with photos and videos. This screenshot is after I scrolled down the homepage. It gives you a feel for the site. As you see, it has articles that can inspire, news about celebrities in Nigeria, and also word from North America. It was nice learning about musicians in Nigeria, as I love world music. After reading an article about a Nigerian pop star, Adokiye, offering to give her virginity to Boko Haram for the freedom of captive girls, I had to look her up on Youtube and listen to her music. It is pretty hot! Check it out in the Youtube video below. I really like this website a lot. 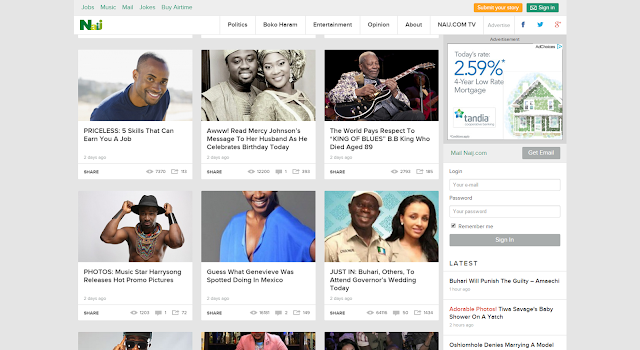 It has everything from entertainment news to even having its own job search for Nigerians. I know we have a Nigerian community here in my city, so I can imagine there is one in most North American major cities. This would be a great site for keeping connected to all that is entertainment and more in Nigeria. Be sure to check them out!